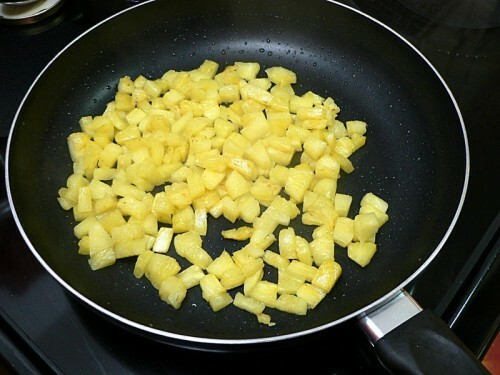 Sure, you can open a can of crushed pineapple. Better, you can chop up a fresh one. But to really go over the top, fry it in coconut oil. 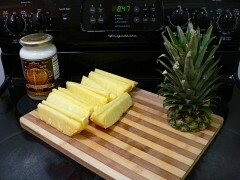 You can see in the ingredients picture that I’ve already cut up the pineapple. If you’ve never worked with fresh pineapple before, click these links for two ways: how to cut a pineapple (1); how to cut a pineapple (2). NOTE: That second link also shows how to grill it to use as an ice-cream topping. That version is great if you’re already grilling. 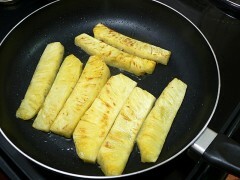 This one adds a little coconut flavor, which is a nice addition but not everyone likes it; and you can do it indoors. 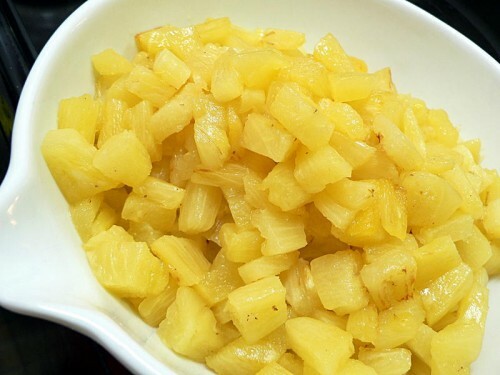 Before you start cooking, decide if you’re going to want big wedges of pineapple for a fancy presentation or diced small to pour on top of the ice-cream. I’ll show both here. 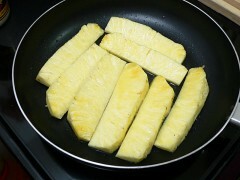 Melt a few tablespoons of coconut oil (click that link to order it online) in a large non-stick pan over medium heat. 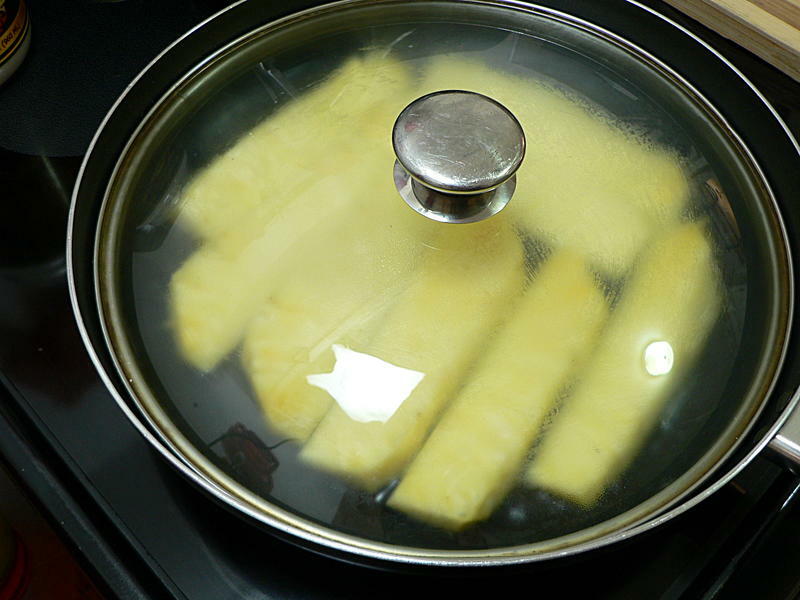 Put the wedges in – careful you don’t splash hot oil on yourself dropping them in – and cover with a lid. Cook for 4-5 minutes, until lightly browned on the bottom then flip them over and cook another 4-5 minutes on the other side. Those are ready to go now. 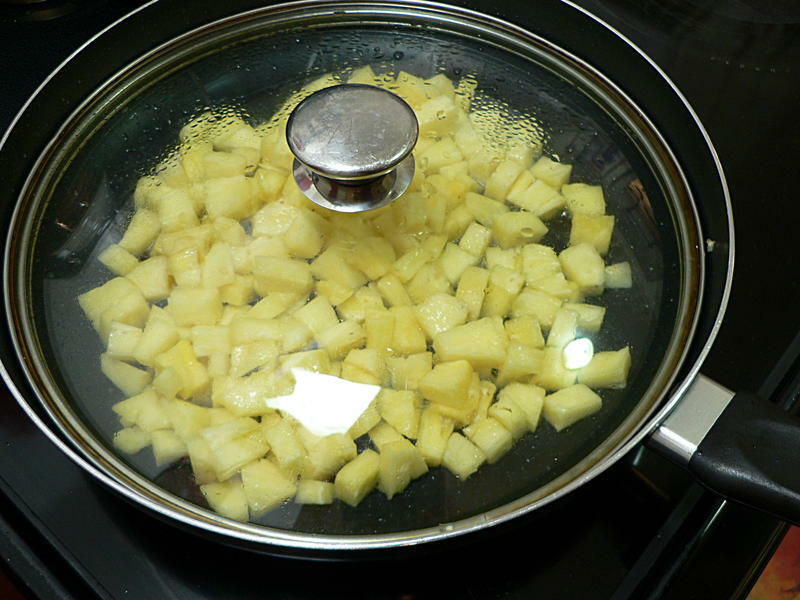 The other option is to dice the wedges up small before adding to the pan (with a couple more tablespoons of coconut oil) and covering. Cook for about 10 minutes, stirring occasionally, until the pineapple is slightly transparent and browned on the edges. Of course, I just put it over some vanilla ice cream. 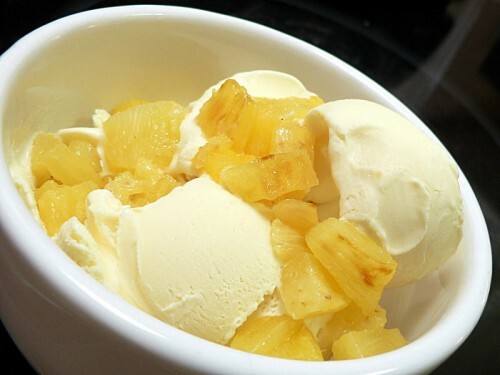 The mild coconut flavor is a nice addition to the sweetness of the pineapple. 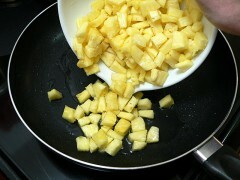 Cut the husk off the pineapple, cut out the core, and dice the fruit. 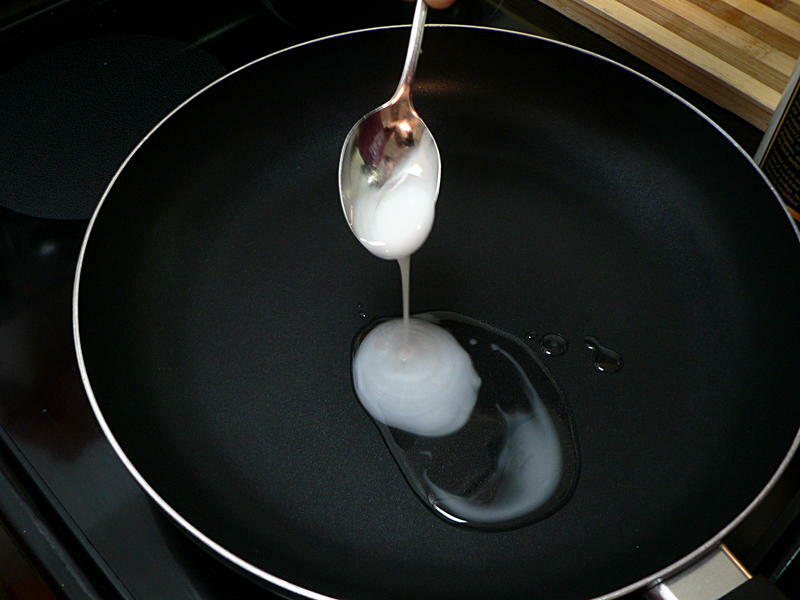 Heat a few tablespoons of coconut oil in a large non-stick pan over medium heat. Cook the pineapple, covered, stirring occasionally, for about 10 minutes until the pineapple is slightly transparent and browned on the edges.